When I first met Gloria, I was a sophomore at Smith. She had come to speak at the Alumnae Association house on campus. I’ll never forget she said that. I smiled, inspired. I was also embarrassed that I had nothing to announce. It was 1995 and it seemed no one else in the room had nothing to share either. The room fell into an awkward silence. After her talk, we surrounded Steinem asking for an autograph or a brief chat, posing questions that needing desperate answering. As I stood in the crowd, I wondered what I would say to her. My mother had given me A Revolution from Within when I was in high school a few years earlier, but I didn’t even have it with me for her to sign. As a mass of Smith students swarmed around her, I allowed everyone to go ahead of me. I had this fantasy that if I went last, I would have more time with her. But when it was finally my turn, she ran out of time. She looked into my eyes and said, “I’m so sorry, I have to go now,” and walked away. A year later, I met her in a kitchen at Cutter-Ziskind, a house on campus. I was working as a waitress for alumnae reunion weekend, serving salmon and tea and lemon tarts to returning alums. Getting the wait staff assignment to Cutter Z was a coup, as we all knew that Steinem would be celebrating her fortieth reunion with her 1956 classmates. While we served wine during dinner, a rumor circulated among us that Gloria would come to the kitchen to say hi. When she finally entered, she did it so unceremoniously, that it was as if she were one of the wait staff waiting to pick up the next bottle of wine. She asked us how we were doing, what classes we were taking, and if we were enjoying our Smith days. She laughed and joked. I stood in the circle staring at her, once again entranced by my famous Smith sister. Stunned into silence, I had nothing witty to share. The other students seemed completely at ease. A part of me remembered that crushing moment in the Alumnae House, and I felt a bit reluctant to engage. I didn’t want to be spurned again. But it didn’t matter. She didn’t seem to remember me. 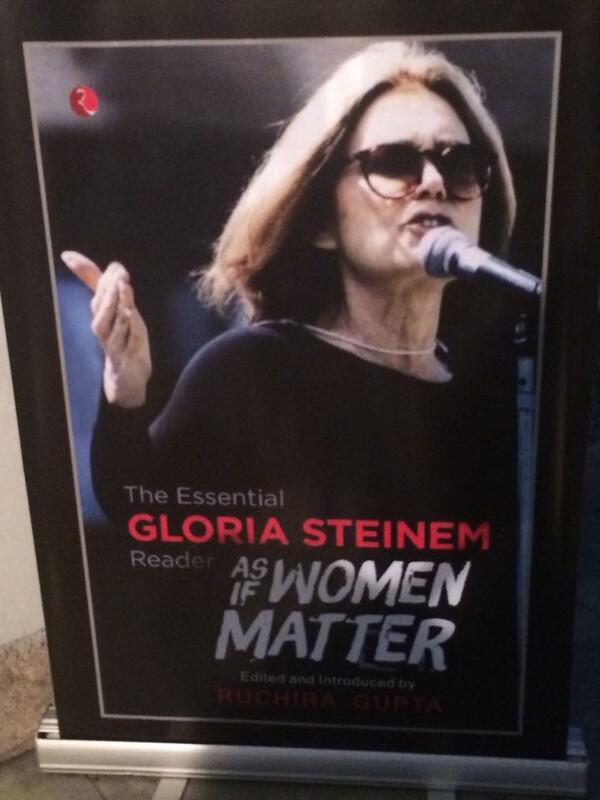 Gloria Steinem’s new book is titled “As if Women Matter,” (photo credit: Ileana Jiménez, Feminist Teacher). When I arrived at the India International Centre, I planted myself in the front row. As I stared at the large banner of Gloria’s image with her hand in the air, I promised myself that this time around, I would make up for botched encounters. 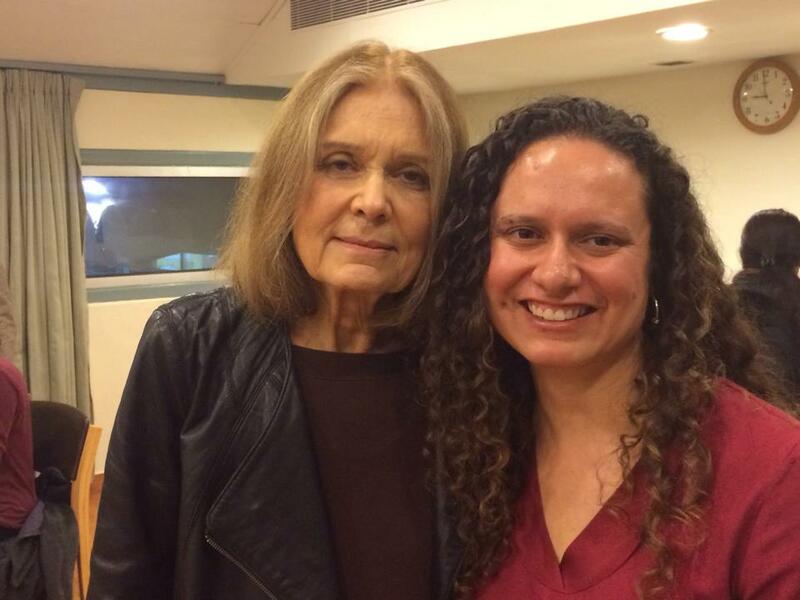 At 38, I had now met Steinem a number of times since graduating from Smith. But none of those meetings seemed to cement a connection between us as sisters. When she walked in, I was just as entranced as I had been at 20. She was wearing a black leather jacket, black lycra pants, a silver studded belt wrapped around a tight brown tunic, and black low-heeled boots. Gracing her face were her signature aviator sunglasses. A 79-year-old feminist icon was now officially in the room. After her time at Smith, Steinem came to India to escape her engagement to a man. Living on a modest $1000 fellowship set up by Chester Bowles, an American ambassador, she spent two years in India starting in 1957. While writing about and engaging in local activism, she became connected to M.N. Roy’s Radical Humanists group and worked alongside Gandhian activists in the villages of Ramnad helping to stop caste riots with Vinoba Bhave’s Bhoodan movement, which advocated giving land to the landless. In India, Steinem learned one of the most important lessons that would influence her feminist thinking: that all oppressions are linked. “Change comes from the bottom up, not from the top down,” she is known to say. Later, during the panel, where she was flanked by leading Indian feminists Ella Bhatt and Gupta, she told the audience that she did not want people to think that she somehow knew all the answers while she was in India during those early years; instead, she shared, she was just a young woman in her 20’s trying to figure out her life. As I listened, I imagined a 1957 version of Gloria getting into the women’s section of Indian railway cars; of her traveling from village to village talking to Indian women during the Bhoodan movement; of her using her writing as a means to secure free airline tickets to get back home, all of which happened during her time in India. If she could travel throughout India in her early 20’s without knowing who she was and where she was going in life, I could surely do it at 38 as an established teacher with a vision to launch a feminist education movement globally. 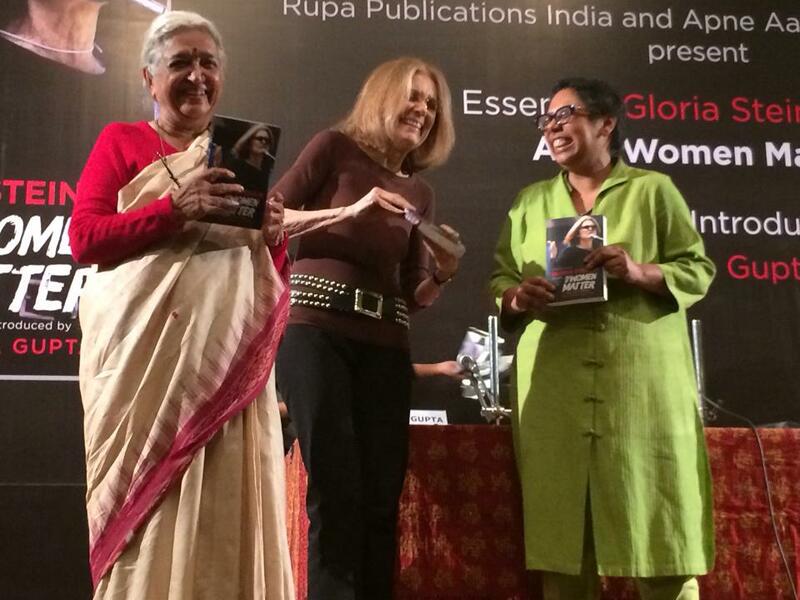 Indian feminists Devaki Jain (left) and Ruchira Gupta (right) celebrate Gloria Steinem’s new book (photo credit: Ileana Jiménez). Later, a group of Indian girls who wanted to start a feminist club at their high school asked Gloria for advice. As a high school teacher who works with young feminists in New York, I was excited to watch these girls reach out to Steinem across age, culture, and politics. “We’ve started an advocacy club in our high school mainly focused on feminism because we noticed that a lot of the social injustices and prejudices outside our school walls in the community of Delhi have permeated the inside environment. The amount of girls involved in student government was going down, there was a lot of sexism that we were seeing going around, and we were wondering, what would be your advice for teenage feminists?” they said. She ended the panel by asking if anyone had an announcement to make, whether there was a meeting, or a protest, or a march to attend. Trust that voice inside yourself. I turned these words over in my head as I walked into a private reception for Gloria hosted by Gupta. Within minutes, I watched a swarm of young women and men surrounding Gloria. I suddenly had flashbacks to that moment in the Alumnae House at Smith. The swarm of students. The waiting. The feeling of not knowing what to say. That sad moment when she looked at me and didn’t have any more time. But I mustered the courage. She looked at me. I gave her my dry elevator speech about us having met before, about our common Smith connection, about our mutual link to the Women’s Media Center, about my feminist high school student, Nathaniel, being on television with her on Nickelodeon. Then I realized that this wasn’t the right approach. “I’m in India now,” I thought. The place where she came to her political consciousness. Reviewing my resume with her was not going to work here. I realized I needed to trust my voice. “I wonder if you might give me some advice,” I heard myself say. She suddenly looked interested. She turned her body towards me, as if signaling that she was ready to answer. I told her something that I was struggling with. It was a question about what to do when racism from whites enters the homes of families of color. I asked her this question because I knew that as a white woman she fought against racism in the U.S. and I wondered what she would say about the toxicity of racism when it permeated our homes not just institutions. She went on to share some anecdotes about her own family. We kept nodding our heads at each other in empathy. This was the best conversation I had ever had with her. I kept thinking about the possibility of her reading something I would write about racism, feminism, and families. My conversation with Gloria Steinem was what I had always dreamed it would be. I realized that what I had wanted all along was a big sister moment. That’s what I had wanted when I waited to be the last one to speak to her at the Alumnae House at Smith when I was 20. It was what I wanted in that kitchen when I was 21. It was what I wanted in India as I embarked on a solo trip at 38. I wanted someone to get me. I wanted someone to assure me it was going to be ok.
Perhaps this is what all young feminists want from their older sisters. I’m fairly certain this is what the older ones want from the younger ones too, because I’m getting to be one of those older ones. We all want that moment or rather many moments where we share our lives and our struggles with each other. We want to speak authentically with each other, and to share our broken-open hearts, as Quaker educator Parker Palmer would say. Sometimes we just need a moment to mentor each other without pretense and without a resume. That’s what Gloria gave me that night in India. Some assurance that I was seen, that I was understood, and that I would make it through by trusting my own voice. 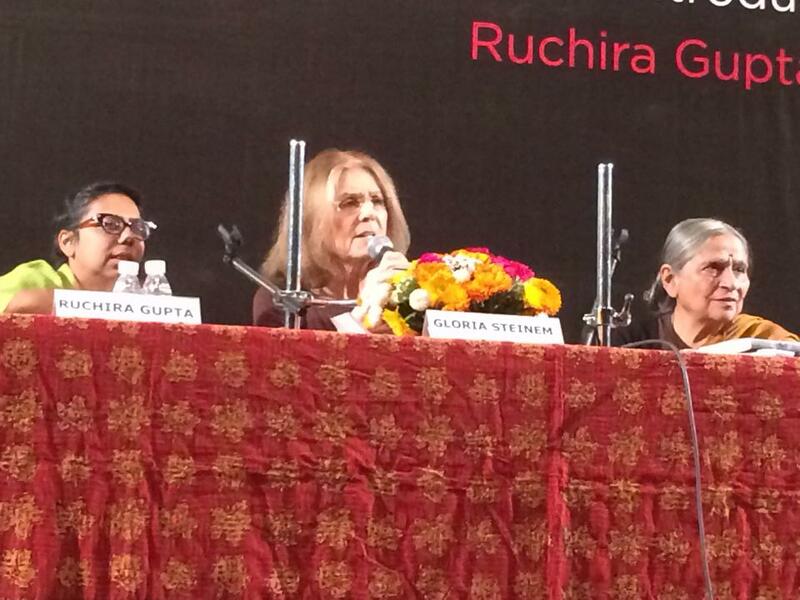 Gloria Steinem and I in India at the International India Centre (photo courtesy, Ileana Jiménez, Feminist Teacher). Gloria Steinem continues to inspire! More than 40 years after women’s liberation movement stormed onto the scene opening a floodgate of dialogue about women’s rights, its deja vu all over again as women are still being moved around like pawns in a political arena. I stumbled across your blog bc I’ve seen your HS students’ blog before… I loved reading about your personal stories, esp. since I’ve visited Smith many times, and also have used Steinem in the classroom. 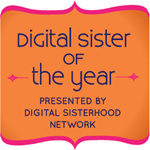 The idea of passing the feminist torch is inspiring — so amazing you got that moment with her! Hi! I found your blog on WP and have read your HS students’ blog before… I loved reading this! It was inspiring to read about your personal journey (I liked the Smith references bc I know that campus well!) and I loved the idea of passing the feminist torch… so amazing you had that moment, at long last.